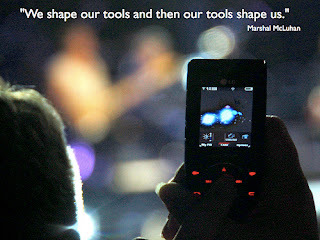 Mike's Musings ... about Ed Tech ... and Other Things: Happy Birthday, Marshall McLuhan! What does the medium flip into (reverse) when pushed to extremes? It is remarkable that when you listen to people talk and write about technology, how much is what McLuhan said over 30 years ago. Although he claimed he was not predicting the future, he certainly seemed to do just that. McLuhan was really trying to provoke and prod people to think about technology and media, to not let the tools shape them. Spark (CBC) podcast series in May 2011 on McLuhan's laws (also a 'tour' of locations he frequented in Toronto). Thanks to Dr. D. Hlynka, a McLuhan scholar at U of M who made me more aware of McLuhan and his importance. Mike, how's it going? I was browsing my blog archive and saw this blog of yours was updated about a month ago, so I had a look. You made a Marshall McLuhan entry. How good of you!! The effects of communications media on social development and progress is central to all time periods, as you know. But, one needs to be literate in the speak of the day to move forward. Literacy is subjective (as I start to regress to our Seminar course). Do the means of communication have to matter? At the time of Gutenberg, society went crazy over print. What did that do to oral culture? Were the same fears had by the people of the day about the loss of orality as people seemingly have today about the loss of reading books due to the electronic modes and short prose and image exchanges? In 100 years, I don't think we'll have the same seemingly difficult problems as we do today. A good book I am just finishing is by Karen Ferneding, Questioning Technology: Electronic Technologies and Educational Reform. Denis mentioned Ferneding to me as a philosophical author, so I got the book. Have you read it? If not, it's worth a look. Have a good year there at the U! Hey Gary, nice to hear from you. I will have to find that book, sounds interesting. Have you completed your M.Ed.? Have a good year.